The conical-shaped Hogdon Law stands at a height of 548 metres above sea level and enjoys unrivalled views, especially to the east. The grass-covered, cairn-capped summit is easily reached from the isolated, single track road serving the lonely farmstead of Ewartly Shank but, for the rather more adventurous walker, this out and back amble would be something of a soft option. So, on this walk you will climb to this little-visited summit via a slightly more circuitous route. Starting at Hartside, close to the River Breamish, you will wander across the windswept grasslands above the farmstead of Alnhammoor to the site of the former cottage of Cobden before continuing gently upwards to the border-crossing Salter`s Road. After visiting the 2007-erected Shepherd`s Cairn Memorial Stone you will make your way to the highest point of the day, the summit of Hogdon Law, before re-tracing your steps downhill towards Ewartly Shank via tiny Hushie Cairn. Then, as you make giant strides back to Hartside, you will cross over the Shank Burn, climb to the 386 metre high top of Little Dod and follow the long downhill path to Alnhammoor Farm. From here a short, sharp climb will deliver you back to your starting point. It is a walk of vast views and big skies. 1. After leaving the A697 north of Powburn the delightful unclassified road towards your starting point at Hartside guides you ever so gently to the boundary of the Northumberland National Park immediately before the wafer-thin Ingram Bridge. Once on the other side of the river, the road begins to narrow as it passes through the tree-shrouded hamlet of Ingram to the small parking area and adjacent toilets at Bulby`s Wood. The road, and your journey, continues onwards, caught between the bracken-festooned slopes of Brough Law and the twinkling River Breamish, before re-crossing the river via the 1908-built, reinforced concrete Peggy Bell`s Bridge. Whilst this fine bridge has recently undergone a number of structural changes its outward appearance, including the ornate metal parapet, remains largely unaltered. The winding road then climbs away from the valley past the buildings of Greensidehill Farm to your starting point immediately before Hartside Farm. This spot marks the end of the public road where there is adequate verge parking (GR NT978162). The farmhouse, which was built in the early days of the 20th century by Lord Joicey of Ford Castle in the Arts & Crafts style, formerly had a plaque on the gable end wall depicting a miner with a pick in his right hand and a lamp in his left hand. This plaque reflected, no doubt, the family`s strong connections with the coal mining industry. Already, before the beads of sweat have even started to roll down your face, there are fine views towards your ultimate objective, the cone-shaped Hogdon Law. With your sac slung over your shoulders it is time to head off towards Hartside. However, before you reach the buildings, you must leave the road behind by turning to your left and following the track signposted, `Alnhammoor 1 Little Dod 2½`. Very soon you will cross a cattle grid as the track then turns to the right and begins to head downhill towards the River Breamish. Ahead, the shapely Shill Moor catches the eye. Once on level ground you will see to your left a recently created pond, not as you might think to attract an abundance of bird life but to be used by helicopters for the collection of water in the event of a nearby moorland fire. The track then crosses the River Breamish via a 1952-built bailey bridge and climbs to Alnhammoor Farm and a small roadside directional marker post. Now turn to your left, cross over the stile, head straight across the field with the farm buildings immediately to your right and exit the field via a small gate. 2. Now turn slightly to your left, head downhill in the direction of a gate and, once there, pass through. Cross over the burn via the small bridge. This is the Shank Burn whose two main tributaries, the Smalehope and Sting Burns, both rise on the high, rough ground which lies between Cushat Law and Wether Cairn. You will cross this burn again later in the day. Now climb over the next stile and cut across the fairly level field on a good, green track. Before you reach the next gate turn to your right and follow a rising track to reach, relatively quickly, a gate and an adjacent stile. Clamber over the stile and continue uphill towards the right hand corner of a distant plantation and, as you labour upwards, you will pass, on your right, a well and truly wind-bent, time-worn rowan tree also known as a mountain ash. The view back towards Dunmoor Hill in the middle distance is worth breaking your forward momentum to photograph. Continue your climb towards the plantation and, all too soon, you will reach a ford across the tiny trickle of the Cobden Sike along with a five bar gate and a small stile (GR NT977142). On the other side of the gate, in close proximity to the plantation edge, lie the grass-covered remains of the hillside cottage of Cobden. However, this is not your way forward. Do not ford the sike. Instead, turn to your right and take the uphill track passing through an old metal gate as you go. Continue to follow this rising green track pausing, perhaps, from time to time to enjoy the back-over panorama. Eventually, after slipping past a sheep stell over to your left, the track splits in two and you will need to follow the left hand fork. Then, further on, when the track joins another one continue to your left with a plantation now clearly in view. After a short distance you will reach a slightly sunken green track at which point you will need to turn left and head through a five bar gate (GR NT971130). This is the Salter`s Road a cross-border track, previously known as the Thieves Road, which in days gone by was used to transport salt from the North Sea coast to Scotland. 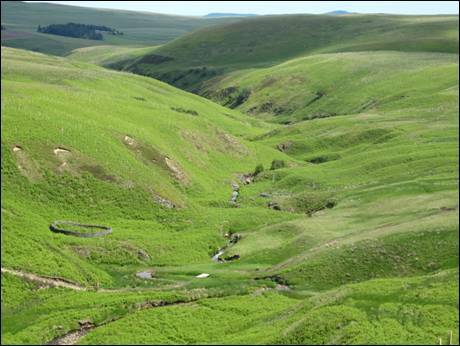 These days it serves as a superb walking route through the lonely Cheviot Hills although when F. R. Banks wrote his book, `Scottish Border Country` in 1951 he said that, ”much of the track had now fallen into disuse and it is not everywhere easy to trace”. How the times have changed. 3. Continue in a south-easterly direction along the Salter`s Road until you reach a quad track junction conveniently marked by a rather large stone. 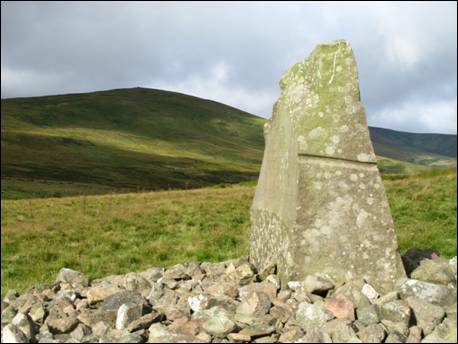 Take the track to your right and, when this track splits in two, follow the right-hand fork over the featureless grasslands of High Knowes eventually reaching the prominent and thought-provoking Shepherd`s Cairn Memorial Stone. Erected in 2007 this fine memorial commemorates the tragic deaths of shepherds Jock Scott and Willie Middlemas who died on the 17th November 1962 during a blizzard , whilst returning from Rothbury Mart to their home at Ewartly Shank a mere half mile from this spot. It was the events of that very sad day that ultimately led to the formation of the Northumberland National Park Mountain Rescue Team. This memorial, set against a backcloth of Hogdon Law, is a chilling reminder of how harsh winter conditions can be in these remote Northumberland uplands. 4. When you are ready to continue your journey, return to the quad track on which you arrived and continue in the same direction of travel to reach, just a couple of hundred metres further on, the single track road (GR NT964126) which, to your right, heads towards Ewartly Shank. Once called Shank House, the Ordnance Survey map of the area has referred to this isolated dwelling as Ewartly Shank since at least 1983. However, the eagle-eyed walker who has, on another day, embarked on a trek along the Salter`s Road from Alnham will have spotted a relatively modern signpost along the way which continues to refer to the dwelling as Shank House. Confusing! To your left, the road eventually leads to Alnham. Now cross over this road and follow the track which, after an initial dip, heads easily towards a fence visible in the middle distance. The ground hereabouts can be a tad boggy so place your feet with precision. Once you draw parallel with a short length of wooden fencing in the predominantly post and wire fence on your right climb carefully over. Once safely on the other side, turn right and follow the fence which also lies to your right. After a short stretch of fairly rough walking you will reach a five bar gate in the fence you have been keeping company. Now turn to your left and follow the clear track which begins its climb towards the summit of Hogdon Law. As you plod your way ever upwards you will pass a superbly constructed cone-shaped cairn, lying to the left of the track and standing at a height of 470 metres (1542 feet) above a distant sea level, from which there is a splendid view to the east. 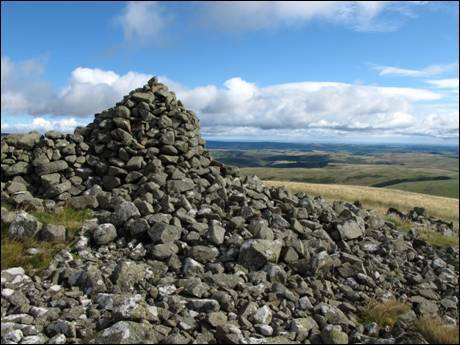 You are now within shouting distance of the summit so keep your toes pointed forward and soon you will reach the huge cairn which adorns the excellent top of Hogdon Law (GR NT949127). The panorama is extensive. To the north lie Dunmoor Hill, Hedgehope Hill, The Cheviot, Comb Fell and Shill Moor whilst the vast spread of the Kidland Forest stretches out towards the west. To the east, across a huge swathe of beautiful Northumbrian countryside, lies the wild North Sea coast. Put your bum on a convenient stone and, with your back against the wind, settle down to a leisurely lunch. Soak up the silence. 5. Very little has been written about Hogdon Law in the various books relating to the Cheviot Hills published over the years although a one line reference is made to this very fine and much-ignored hill in W. W. Tomlinson`s excellent 1888 book, `Comprehensive Guide to Northumberland` under the heading of `Height of Principal Hills`. As a consequence of this `conspiracy of silence` you will probably have had the summit to yourself. It is now time to retrace the majority of your bootsteps back to the single track road which serves the residents of Ewartly Shank. So, follow the faint indentations of the helpful quad track which brought you to this elevated place passing, once again, the beautifully constructed conical shaped cairn, this time on your right. 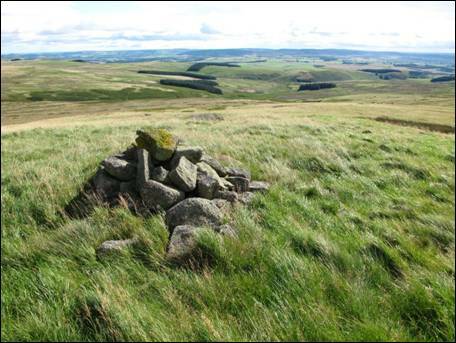 As you continue downwards keep your eyes wide open for the small cairn which stands a short distance to the right of the track and which is named on the Ordnance Survey map as `Hushie Cairn`. It is well worth a visit. As you begin to draw reasonably close to the cairn you will need to leave the quad track behind and to pick out a suitable route across the pathless grass ridge. The choice of route is yours but the extra effort will be well rewarded with fine far-reaching views. Once back on the quad track continue downhill and when you reach the five bar gate you passed at the beginning of your climb to the summit pass straight through. Stay with the green track across the field and exit via a second gate. You have now returned to the single track road and your onward route lies to your left. Keep with the road as it meanders gently downhill joining, as it goes, the route of the Salter`s Road just short of the farm buildings. 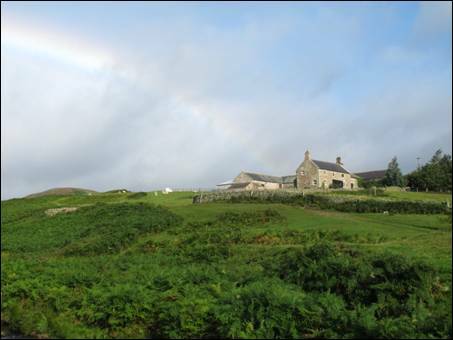 When the farm is reached, with the bungalow on your left, be sure to turn right between the stone building and the corrugated shed and to follow the path which leads you through a shelter belt of trees to emerge high above the Shank Burn (GR NT959136). 6. The view from this spot is one which will, over the coming years, be subject to some change. The keen-eyed will notice that there has been a substantial amount of recent planting along the slopes tumbling down to the burn and, as the years trundle on, the predominantly bracken-blanketed hillsides will be covered by ever-larger trees. Whether this will be an improvement on the already splendid scene will depend on your personal viewpoint. For the present, just enjoy it as it is. The track, which has recently been re-engineered, now winds you downhill and when level ground is reached a tiny bridge will lift you across, for the second time of the day, the snake-like Shank Burn. Once through the small gate on the other side you will be faced with a fairly stiff climb to the 386 metre (1266 feet) high top of Little Dod. You will, inevitably, pause from time to time to admire the view which, to your left, encompasses the sweep of Cushat Law. Just keep plodding on. You will soon be there (GR NT952141). 7. With a mere 2½ miles to go and with little left in the way of ascent you will be starting to feel that you are almost home and, hopefully, dry. Time, therefore, to press on to the next directional fingerpost, little more than 200 metres further on. Once there, it is time to step off the time-served Salter`s Road, to turn to your right and to start the long and steady descent to Alnhammoor. So, with the grass-covered slopes of Shill Moor to your left and the Shank Burn away to your right and out of sight, follow the generally clear path which has, in the recent past, been re-designated a `Restricted Byway`. The occasional directional fingerpost will keep you on the `straight and narrow` and all the while you will be edging ever closer to the pronounced valley of the Usway Burn. You will, as you move ever downwards, enjoy excellent views of Dunmoor Hill. Eventually, after crossing the thin slither of the Rowhope Burn (yes, another Rowhope Burn!) you will cross a ladder stile before then passing behind the buildings of Alnhammoor Farm. Once at the end of the wall, on your left, you will be greeted by a shin-high marker post and this is your cue to turn left through the small gate you exited a few hours earlier, to re-cross the field and to re-join the track back to Hartside via a small stile. 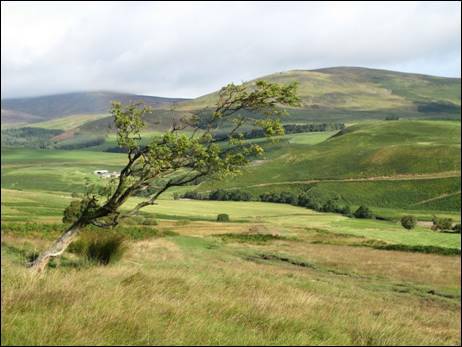 Once on the track, turn to your right, head downhill and re-cross the tree-sheltered River Breamish. Now all you have to do is to stay with the track and, after a slight `sting in the tail` ascent, all too soon you will be back where you started. Now it is time to reflect on the events of the day.